New Delhi, Oct 26 (IANS) Indian Foreign Secretary S. Jaishankar on Thursday said a practical approach was needed to tackle the Rohingya refugee crisis arising out of Myanmar’s Rakhine state, rather than strong condemnation. “The fact that here is an exodus of a large number of people from Rakhine state is clearly a matter of concern,” Jaishankar said in response to a question at a seminar on “Connecting the Bay of Bengal: India, Japan and Regional Cooperation” organised by the Carnegie India think tank in association with the India Development Foundation. “Our objective would be to see how they can go back to their place of origin,” he said, adding, however, that this was not easy. He said that India has been “talking to Bangladesh and we have separately engaged with Myanmar”. The Foreign Secretary’s remarks come even as the UN put the total number of Rohingya refugees that have arrived in Bangladesh from Myanmar since August 25 at 604,000. Jaishankar said that such a situation needed “a much more sober, realistic, locally sensitive approach than we have seen in some quarters”. After Prime Minister Narendra Modi’s visit to Myanmar in early September, India had avoided talking about the military crackdown in Rakhine state and the refugee situation and had condemned the attack on the Myanmar security forces by the Rohingya militants. Later, on September 9, India modified its position, apparently after the Bangladesh High Commissioner Syed Muazzem Ali called on Jaishankar to discuss the issue. New Delhi voiced “deep concern” over the Rohingya refugee issue and asked Myanmar to handle the situation in the Rakhine state with “maturity and restraint”, in the statement. The Rohingyas do not have citizenship in Myanmar and are sparingly given refugee status in Bangladesh. Myanmar State Counsellor and Nobel Peace laureate Aung San Suu Kyi has come under criticism from various international quarters for the manner in which the situation was being handled in Rakhine. On Sunday, during her visit to Bangladesh, External Affairs Minister Sushma Swaraj said India was “deeply concerned” over the violence in Rakhine state. India has also come to Bangladesh’s aid in handling the crisis by sending relief material for the current influx of Rohingya refugees under Operation Insaniyat. India is also seeking to deport around 40,000 Rohingyas living in the country. Jaishankar said that one of the areas which the Bay of Bengal Initiative for Multi-Sectoral Technical and Economic Cooperation (Bimstec) should collaborate is one the humanitarian assistance disaster relief. The Bimstec regional bloc comprises Bangladesh, Bhutan, India, Myanmar, Nepal, Sri Lanka and Thailand. 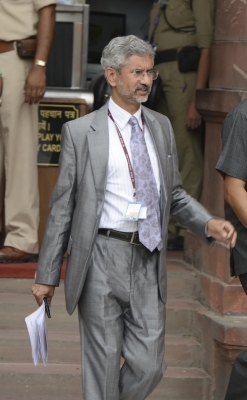 “I think, partcularly in the last three years, from the Nepal earthquake or the Yemen civil war or the Sri Lankan mudslide or the Maldives water crisis or even this Operation Insaniyat we did for the displaced persons who came out from the Rakhine state, we have been very active in pushing that,” Jaishankar said. “We certainly think this is an important part of regional cooperation,” he added.